Calvin F. Cole, Sr., 95, passed away on September 4, 2018 in Jacksonville, FL. He was born on February 24, 1923 in Quincy, FL to the late John Calvin Cole and Ida Frances Davis. Calvin was a WWII veteran and received the Good Conduct and WWII Victory Metals. Calvin graduated from Tuskegee University with a Bachelor of Science Degree. He worked for the US Postal Service and His and Hers Confectionary, business owner of a dry-cleaning service, and co-owner of Corest Properties. 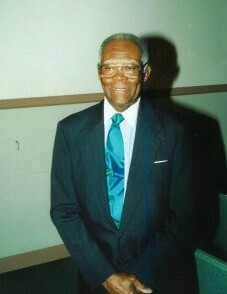 Calvin was a member of St. Paul A.M.E. Church and affiliate member of Mt. Zion A.M.E. Church. He was a member of the Tuskegee Alumni Association and a hospice volunteer. Preceding Calvin in death are his parents and wife, Corine Wilkes Cole. Surviving Calvin are daughters, Gail Cole Mathis (Edgar L.) and Rev. Cheryl Cole Hairston (Frank; sons, Calvin F. Cole, Jr., Norris V. Cole, and Rev. Victor D. Cole (Maria): grandchildren, Ebony Mary-Corine Hairston, Cherise Monique Jones, Arielle Elizabeth Hairston and Elyce Gabrielle Cole; great-grandchild, Nikkia Daja Staples; nephew, Rev. Dr. Herman Kelly, Jr. (Linda); niece, Carmen M. Kelly; cousins, Ernest Jameson (Mary), Mr. and Mrs. Noel Jameson, Terri Cooper (Terrance), Damon Jameson, Pamela Cunningham and other Detroit family. request, in lieu of flowers, donations may be made to the Calvin F. Cole, Sr. and Corine W. Cole Memorial Education Scholarship Fund, with checks payable to Mt. Zion A.M.E. Church, 3811 St. Augustine Road, Jacksonville, FL 32207. Aaron and Burney Bivens Funeral Home, 529 Kingsley Avenue, Orange Park, FL 32073, (904) 264-1233, is serving the family.